The Jackson Creek portable Canine Kennel is constructed entirely of aluminum so that it will provide years of service and never rust. The Canine Kennel is 9 1/2' long X 4' wide x 46" tall. 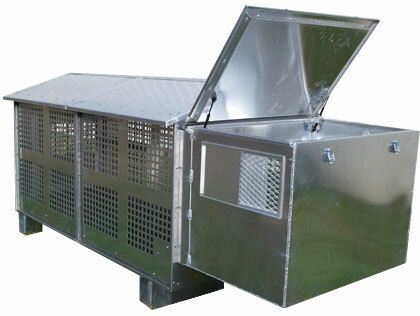 The Canine Kennel can be disassembled for easy transportation and reduced shipping costs. The Canine Kennel run has ventilated side-walls, diamond tread aluminum sloped floor for waste drainage and has a drainage port in the bottom corner. An aluminum floor with Linex protective cover is available as an option. The Canine Kennel run has a solid aluminum roof and a large entrance door with locking latch and a step for easy access to the Canine Kennel sleeping box. 9" legs keep the Canine Kennel off of the ground. 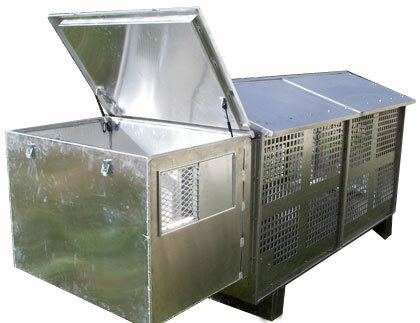 The Canine Kennel sleeping box measures 42" wide X 30" long X 30" tall and features insulated double walls, large side vents with closures, lockable latches, opening lid for easy cleaning with gas struts on the lid to hold it open, rubber floor mat and PVC door cover strips to conserve body heat in cold weather. 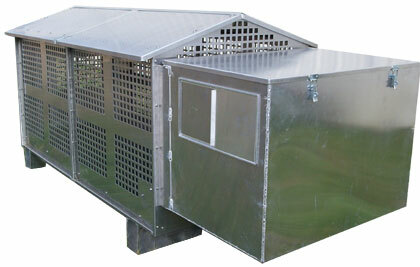 The stainless steel Canine Kennel has all of the features of the aluminum Canine Kennel including the Linex floor.